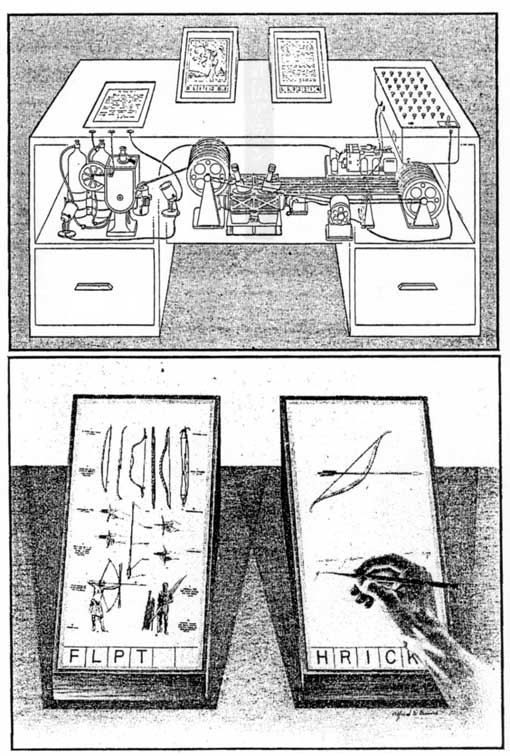 Vannevar Bush's "Memex," a precursor and inspiration for J. C. R. Licklider's concept of digital libraries as "procognitive systems." J. C. R. Licklider has as strong a claim as anyone to be called the inventor of the Internet–or at least the inventor whose vision and tireless evangelizing propelled the Internet into being. From his 1960 essay “Man-Computer Symbiosis” to his support for Doug Engelbart’s Augmentation Research Center, Licklider’s vision of computing inspired and encouraged many generations of computer scientists and network engineers. Indeed, Licklider’s leadership at the Advanced Research Projects Administration paved the way for ARPAnet, the network that eventually became what we now know as the Internet. But what does this story have to do with libraries? Licklider’s procognitive system would process the whole corpus of recorded thought and information in order to capture the semantic relations and content within the data across all discipline lines. Licklider expected that the system could then be addressed and replied to in natural language format. The scholars and other users would receive natural language knowledge responses to their queries and searches. They would still however have to read and think and generate insights and make discoveries beyond what the system provides. The system would provide semantic-like concepts and answers but the humans would make the final and meaningful interpretation. Thus they could contribute back into the system in an ever-expanding symbiosis. Licklider projected that eventually humans would interact with the growing corpus of knowledge by controlling and monitoring the processing of information and requests into knowledge rather than by handling the details and all of the processing in their own brains. The processing in their own brains would then be doing the most advanced and creative knowledge work. –Jay Hauben, “Libraries of the Future 1945 – 1965,” in Wissenmanagement in der Wissenschaft, Berlin: Gesellschaft für Wissenschaftsforschung 2008. In Licklider’s vision, the library was not merely a repository or a resource. It was a learning technology, using natural language, that would make the corpus of human knowledge into a living thing, almost a companion. The seventeenth-century poet John Donne’s vision in Meditation 17 of all humanity lying open to one another like books in a library found an unexpected analogue in Licklider’s “procognitive” system, one that has eerie contemporary similarities to “Qooqle,” currently under development at the MIT Media Lab. It would be presumptuous of this task force to try to develop the idea of a digital library much farther than this. That development is rightly the work of specialists in libraries and information science in the library system at Virginia Tech. We simply pause at this moment to recognize that in addition to Virginia Tech’s proud history of innovation in electronic theses and dissertations, cataloging and circulation software, and other milestones in the emergence of digital librarianship, there is also the enticing prospect of our reimagining libraries as learning technologies. Indeed, libraries of the future may well be the inter- and trans-disciplinary platform on which scholars at every stage of their learning can stand to move the world–including the university itself. Study carrels are now learning commons. Librarians are “embedded” within courses both synchronously and asynchronously. Newspapers, films, music, maps, diaries, and the treasures of special collections worldwide are being digitized, cataloged, and made available to anyone with a network connection, anytime. While manuscript, printed, and digital resources will likely continue to co-exist in university libraries in 2020, the concept of the emerging digital library as a “procognitive” system may be the most transformational learning technology yet in higher education.